The following meditations are offered as a means to accomplish both. They are meant to be used as a tool that can bring the reader into a closer relationship with our gods and goddesses. Feel free to use them at your leisure. The first seven are meditations offered for mornings each day of the week. heroic. Remind us of your bravery and your sacrifice. Give us the courage and strength we need to fetter our own Fenris. Keep us mindful of our duties, and help us keep our fears bound as tightly as you bound old Slaver Mouth. Thus doing, may we share in your glory by imitating you. WE GIVE YOU A MOST HEART-FELT HEIL, ZIU, as we honor the Ziu that resides in us all! GIVE YOU A MOST HEART-FELT HEIL, WODAN, as we honor the Wodan that resides in us all! inspire our appetites for that which is lusty and good. Excite our growth from strength to strength; teach us, elder brother, how to throw our own Hammer, and slay the giants who oppose our will. WE GIVE YOU A MOST HEART-FELT HEIL, DONAR, as we honor the Donar that resides in us all! 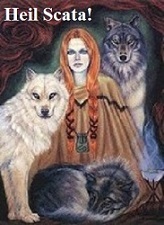 Sibba, Great Goddess of Fertility and Family, wife of Donar; let us see you in all the growing things that sustain our lives. Help us look beyond the packaging and promotion, to the richness of the Earth from which all bounty comes. When ordinary eyes see only corn, let us see your golden hair hid in its silk. When others see only bread, let us see the grain, beyond that, your smile and laughter. Feed our might and main, Holy Sibba, that we may do our work in the world. 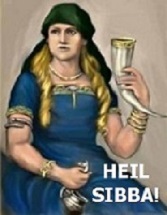 WE GIVE YOU A MOST HEART-FELT HEIL, SIBBA, as we honor the Sibba that resides in us all! Paltar, blameless god, gloriously shining god, restoration god, beloved son of Wodan and Frija. Let your goodness and your reconciliation smooth our paths on Earth. When our days here are over, light up death’s darkness with the promise of rebirth. Help is to avoid evil, and seek the good. Inspired by you, we will keep our reputations spotless that our lives be proclaimed a victory of the Spirit, and our leaving this life a tragedy. 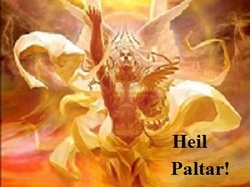 WE GIVE YOU A MOST HEART-FELT HEIL, PALTAR, as we honor the Paltar that resides in us all! favored of you. WE GIVE YOU A MOST HEART-FELT HEIL, SCATA, as we honor the Scata that resides in us all! 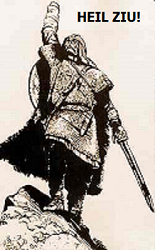 Wuldar, glory-god, hunting-god, ski-god, dueling-god; Son of Sibba, step-son of Donar, you glide through the snow-clad forests bringing death to game and life to your people. Remind us that life feeds on life, and that the beauty of the prey is formed generation after generation by the culling ferocity of the predator. Let your Yew-bow be the great World-Yew under another guise. Ostara, trustworthy goddess; keeper of the golden apples of youth and eternal life, keep us young inside. When we are starving for laughter, hungry for the lightness that comes with having few years on our shoulders, slip us one of those gleaming fruits that we may see the world through youthful eyes. Let springtime be in our steps, love in our hearts and a song on our lips. Change us to the core! Fill us with optimism and dreams for the future. 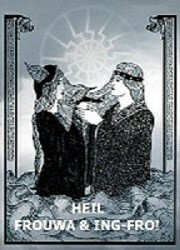 WE GIVE YOU MOST A HEART-FELT HEIL, OSTARA, as we honor the Ostara that resides in us all! fish, is still there. Like the salt-sea spray, awaken us to the possibilities that surround us, so that our nets may be cast wide and return full of life’s gifts. WE GIVE YOU A MOST HEART-FELT HEIL, NIRDU, as we honor the Nirdu that resides in us all! Eger und Râhana, mysterious keepers of the deep hall at ocean’s bottom, host to the drowned and the sea lost. Your dwelling might be thought sad and gloomy, but you are known to be kind and hospitable ale givers. In your goodness then, cheer us when waves of misfortune pound our life’s fragile boats to the bottom. For even at the bottom, there is warmth, cheer and hope. Be our assurance; be our inspiration to strive on despite the swells and swirls of fate. WE GIVE YOU A MOST HEART-FELT HEIL, EGER UND RÂ HANA, as we honor the Eger und Râhana that resides in us all! dishonor be barred from Ensiwëg, the Rainbow Bridge, leading to our heart’s abode. Be a model for vigilance, that we may rise to the best that is in us, and someday join the Noble Gods in their shining homes. WE GIVE YOU A MOST HEART-FELT HEIL, HEIMO, as we honor the Heimo that resides in us all! HEART-FELT HEIL Êra, as we honor the Êra that resides in us all! Saga, you’re the goddess of history; part and parcel of our ever expanding past. As we share in Minnatranc, whisper to our hearts of the stories about our gods, our ancestors, our heroes and their glories. Be the resource for our memories should we ever forget from whence we come. Gently remind us that we all have a rich history from which to pull. For it is as we remember and respect the past can we deal with our present, knowing that we will some day have to deal with our spiritual debt. We honor you, Saga, as a repository for the basis of all that we are, all that we are coming to be, and all that our offspring will inherit from us. WE GIVE YOU A MOST HEART-FELT HEIL, SAGA, as we honor the Saga that resides in us all. cold shadows of the glaciers to the colder shadows of space, always, we have been your people. Guide and guard your North Folk as you did in ages past. Wodan, give wisdom and craft to wits shaped by ice and fire that our foes be foxed. Donar, give us strength and the will to use it. Ing-Frô and Frouwa, give full wombs so that bodies will be found for the souls of heroes. Let your Northern Folk grow in number and in power, so that our kind may live, love, survive and thrive, not just today, not for a millennium, but for ever and ever!